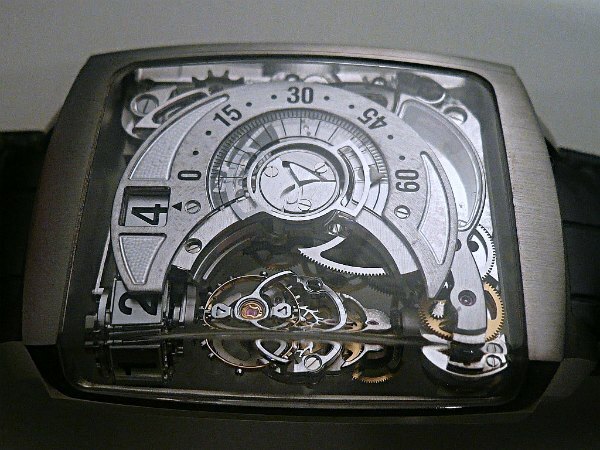 I can already tell that the Hautlence HL2 (HL2.0) watch is going to be one of my favorites of 2011. I learned about the piece sometime ago, and now we have images of an actual prototype. The thing works. Fellow watch lover and watch forum moderator Francois-Xavier Overstake had a wonderful opportunity to view (and play with) a prototype of the upcoming watch from the boutique Swiss brand. The hands-on pictures in this post are his, a link to his article is below. What is this thing? Only the latest and greatest machine that tells the time. Pardon the watch’s unfinished stated. Though all the promise is there. This is a new step for Hautlence – who finally get their own movement. Interestingly enough if you compare the watch to their earlier models -the way of telling the time is ‘thematically’ the same. Meaning a retrograde minute hand (that is unique) as well as quasi-digital hour indicator. The HL2 is also the brand’s first automatic movement, it also contains a power reserve indicator (not yet complete in the prototype), and a behaves a bit like a locomotive! Ian Skellern was able to get a great video of the movement in action. Really how else can I describe that? 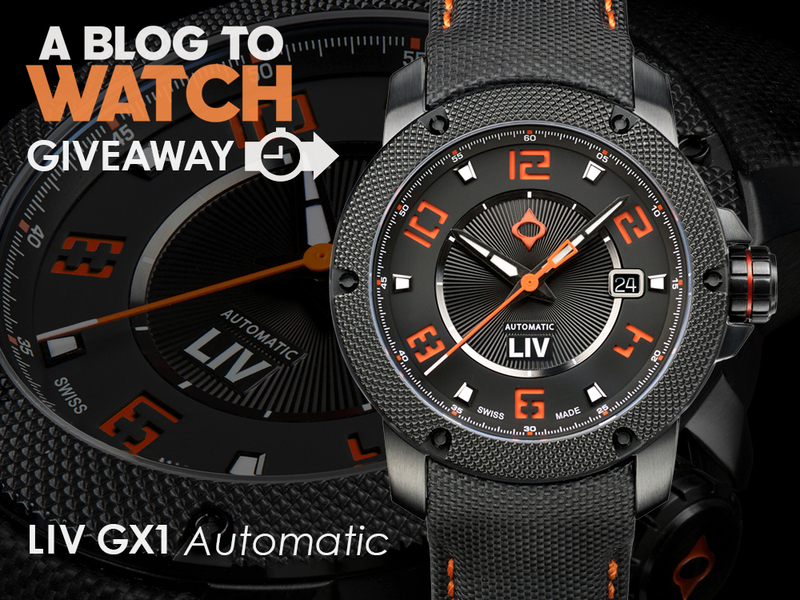 This is one of the most steampunk – gadgetorageous – machinatastic watch movements I have seen in a long time. Interesting type of rendition on the concept of a tourbillon by having the the escapement component column rotate on its own axis like that when the hour changes. The hour indicator blocks are all placed together on a tank tread like chain with a system for moving it that looks like the rod which turns wheels on a steam powered locomotive. Totally complex, but you don’t need to train me to like it (worst pun ever!). The hour indicator chain doesn’t exactly “jump” when the hour changes, but does seem to move in one hour increments. The system looks like it uses a ton of power – but the movement seems to manage to do it. 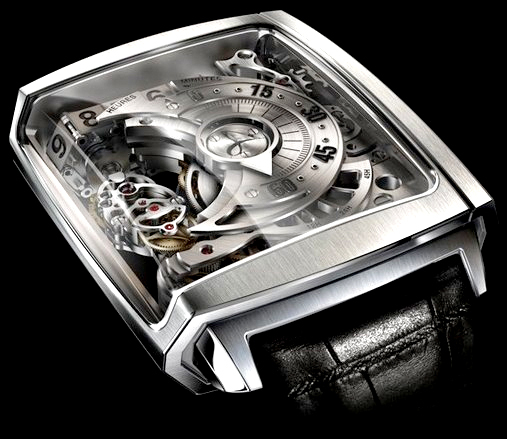 The movement design is amazing, any typical of Hautlence’s good eye for mechanical design and aesthetic. There are a lot of “firsts” in this watch. Alone that is something for the small brand to be proud of. Apparently it took Hautlence about three years to make the watch work, I easily believe that. The large rectangular case with its gentle bulges is large – not sure how large yet, but this is no small watch. 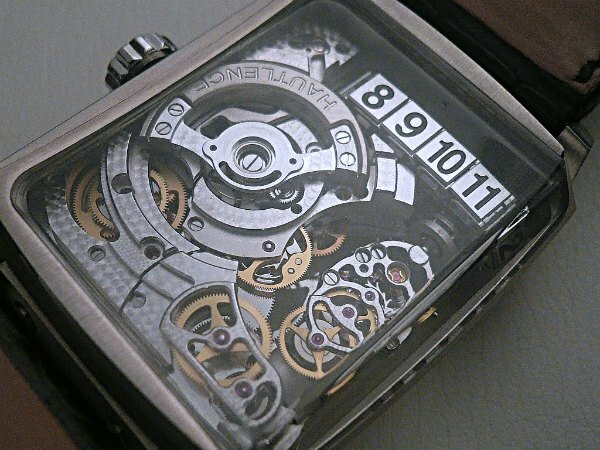 It uses a clever sapphire crystal the wraps around the left side of the watch. 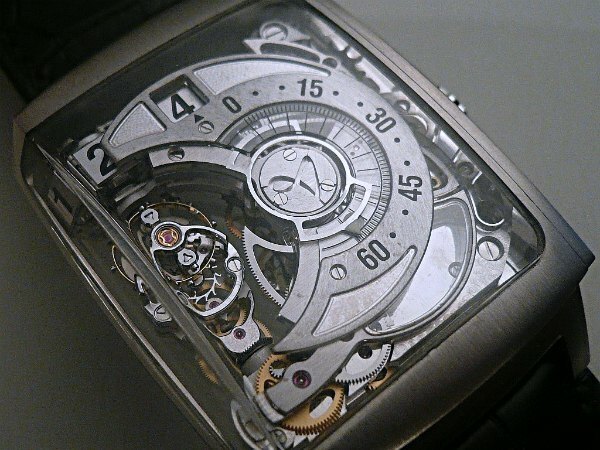 Really an impressive technique to make the case interesting while also allowing a better view of the movement. This of course is the side of the case you’d be seeing most if it was worn on your left arm. I really can’t wait to get the HL2 on my own arm. Price will be about $200,000. More on it soon. Thanks to Equation of Time for some images. Very cool. Cant wait to see a finished product. It looks quite heavy, which I like – everything is metal. That has to be one of the coolest sapphires ever. This is one piece that might be heavily complimented by a slightly tinted sapphire. Holy Carp! That’s awesome. If I had this watch I’d have to set an alarm so I would not mis an hour changeover. That is amazing! Much more impressive than that crazy Concord from 2 years ago. Very impressive! This is like a mechanical version of Devon Tread 1 (which, I gather, still isn’t for sale yet). The Devon Tread 1 should be for sale about now. Holy mackerels Batman…we have a winner here for sure! That watch is way cool. 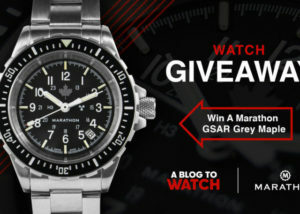 Thanks, Ariel, for always highlighting some of the coolest watches on the planet! Don’t you ever proofread your articles?! They are always full of spelling and gramatical errors.